My parents bought me my first bike in 1973. It was a Schwinn Sting-Ray Junior in Kool Lemon color with a white sparkle banana seat. After some training wheel work, followed by many skinned knees, I soon learned to ride a bike. I would later convert it into a BMX bike by replacing the seat with a regular saddle and putting a knobby tire on the back wheel. Of course I removed all the unnecessary items such as the chain guard and fenders. I actually kept this bike until a garage sale in 1992 when I sold it for $5. It sold right away. A few years later, I regretted that sale and I was back in the hunt for a Sting-Ray. The banana seat bug had hit me again. In November 1997 I found a boy's Typhoon with 20 inch wheels at an antique store. I bought it, and by the summer of 1998 I had it converted into a Sting-Ray. This is a fun bike, but even before I finished it, my mind kept thinking of different muscle bike configurations. Then one day in 1998 I walked in Budget Bicycle's used bike store. There I saw a 1959 Schwinn cantilever frame with a really crummy paint job. As I looked at it, I realized it must be for 24 inch wheels. Then I got to thinking, what if I put a 24 inch wheel in the rear, and a 20 inch wheel in the front via a springer fork for a 26 inch wheel? If I put on a banana seat and high rise handle bars, it might just look like an enlarged Schwinn Krate bicycle. It would be the same size as a Schwinn Manta-Ray but with improved aesthetics. In other words, I could make an adult size Krate with this frame. Even though my Sting-Ray was still under construction, I bought the frame. The frame sat for 2 years until January 2000 when I finally decided to begin construction on my big boy's banana seat bike. The frame had a few parts on it, such as a seat post clamp, that I had to take off before I could paint it. Most of the parts came off just fine, except for one headset bearing cup. This cup confused me for a few days until I finally realized I could pound it out from the inside. With the frame bare and after a quick sanding job, I was ready to paint. Since I did not want to be real picky about the paint job, I chose green Rust-Oleum Hammered Metal Finish spray paint. The manufacturer designed this paint with a texture to hide imperfections. In other words, the paint should look good even if used by a sloppy painter like me. I chose green because the store did not have red. I hung the frame in my cellar from a string. I sprayed the frame with the green paint. I clearly missed a number of spots on the first coat, so I put on 2 more coats. Now that I successfully painted the frame, I noticed that I had made an incredible mess. The paint that missed the frame fell to the floor, but as it floated down it had dried. The painting had covered my floor with green powder and I was tracking it all over the place. It was time to vacuum. This was a small problem compared to the fact that my house now stank of paint. It took a few days for the paint odor to disappear. Clearly there was not enough ventilation for spray paint in the cellar. I plan to do future paint projects outside. My paint job had a fair amount of drip marks and other imperfections, plus the hammered texture looked a little odd. I needed a name that would work well with this paint job. After some thought, I came up with "Alien-Ray". Of course you cannot do much with just a frame. It was now time to purchase all the parts. The following day, February 6, 2000, I went to Community Thrift Store (Currently out of business). There I found a used generator light set for $1.50. I bought the lights and used the red tail light on the Alien-Ray. Community Thrift Store had a really cool system. Let's say you have an old Schwinn Apple Krate bicycle that you do not want anymore. You would bring it down to Community Thrift Store and say you want to donate it to charity. They would show you a list of dozens of charities and you would pick your favorite one. They then would place the code for the charity you picked on the price tag of the Apple Krate. When the Apple Krate sold, Community Thrift Store would send the money, minus a little for operating expenses, to your favorite charity. This system provided a very slick method for converting your unwanted stuff into monetary donations for your favorite charity. It is too bad they are no longer in business. From the Community Thrift Store I went to Budget Bicycle Center (930, 1124, 1201, 1202, 1230 Regent Street, Madison, Wisconsin). Budget Bicycle occupies 5 buildings with a different specialty in each building. There I purchased some wheels, tires, tubes, a computer, and a seat. For the rear wheel I purchased a NOS (new old stock) 24 x 1 3/8 Schwinn rim with a Sturmey Archer 3 speed hub and coaster brake. For the front I purchased a NOS 20 x 1 3/8 (Schwinn Fastback size) Schwinn wheel. I purchased black wall tires, tubes, and rim strips for both wheels. For the seat, I purchased a new Schwinn white sparkle banana seat. I like keeping track of my mileage, so I also purchased an ACT C-1x bike computer. From various other places I purchased a chain, reflectors, cheap plastic pedals, and a combination bike lock. I picked up my Lovely Lowrider order at the UPS station on February 15, 2000. I now had to do some measuring. At this point I determined the proper crank size. A too long of crank would hit the ground too often, while small cranks would unnecessarily cause me to pedal in tiny circles. I determined a crank with 5 1/2 inch crank arms would work best. I made another trip the Budget Bicycle Center and purchased the cranks and also a new 46 tooth Schwinn "Mag" front sprocket. I now had most of my parts and was ready to begin assembly. I put on the front fork first. Since this was a fork for 26 inch wheels its Steerer tube was for a bigger frame. I had to place the steerer tube in a vice and saw it down to size. This also changed the angle with which the spring adjusting bolt connected to the top of the steerer tube assembly. I needed to bend the bracket that connected the spring adjusting bolt to the top of the steerer tube. Then I realized the bracket on my Sting-Ray was at the correct angle for the Alien-Ray, and the Alien-Ray bracket would also work on the Sting-Ray. So, I switched the brackets on the Alien-Ray and Sting-Ray. I now was able to properly mount the fork onto the frame. With the fork on, I attached the front wheel. Next, I added the gooseneck and handlebars. Then I put on the rear wheel followed by the cranks and sprocket. I ended up pulverizing my chain tool while trying to remove links from the chain. So the next day I purchased a Park Tool CT-3 chain tool. The CT-3 works well which is why many bike shops use it. Now I successfully put on the chain. After I put on the pedals I began trying to figure out the Sturmey Archer 3 speed shifter and cable. I did not seem to have enough parts, so the next day I went to Yellow Jersey (419 State Street, Madison, Wisconsin). The owner of Yellow Jersey happens to be a 3 speed fan. I ended up buying a pulley and a new cable with a longer housing. With my hi-rise handlebars there is a longer distance from the shifter to the frame than a typical 3 speed bike, hence the need for the longer housing. Once I had all the right parts, setting up the 3 speed shifter was fairly easy. Next, I added the seat post, sissy bar, and banana seat. With the addition of the banana seat, the bike took on the look I had imagined when I first saw the frame. I then added the handle bar grips. The bike was now a very ride able machine, but not done yet. It was time to do some more shopping. I was planning to power my rear light off the batteries in the front light. A standard light bulb would drain the batteries too fast so I purchased a Jumbo Super-Bright LED (Catalog Number 276-086A) at Radio Shack. I also needed a head badge for the Schwinn frame. I went to Williamson Bicycle Works (3729 East Washington Avenue, Madison, Wisconsin). I ended up buying a used green head badge and some Schwinn Quality stickers. I also purchased dry transfer lettering at an art store. On, February 27, 2000, I went to Tom Meyers V8 Ford and Bicycles (1161 Highway 14, Oregon, Wisconsin; I recommend calling ahead, phone 608-835-8833). 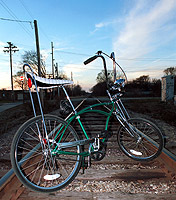 I ended up buying a couple of bikes, a frame, and a reflector. I used the reflector and a chain guard from one of the bikes on the Alien-Ray. Now it was time to assemble my lighting system. The front light I purchased had the positive connected to the housing and the negative connected straight to the bulb. This means the Alien-Ray will have a positive ground which is the opposite of most cars. I connected a wire to the negative wire in the light and ran that back to the taillight spot. I made the connection after the light switch so that the switch would then turn on both the front and rear lights. Before I could mount the taillight I had to saw off the section of the bracket that used to hold the generator. With the LED I purchased, the longer lead was positive so I needed to connect that lead to the housing of the taillight. I then connected the short negative lead to the wire I had previously run back from the front light. LED lights are directional and will not work if wired backwards. Once mounted and wired, the lighting system works amazingly well. I made the name "Alien-Ray" official by adding it to the chain guard using the dry transfer letters. The chain guard then bolted on perfectly. Next, I added the ACT computer followed by the reflectors. 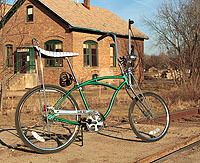 At Tom Meyers' bicycle store, the red reflector I had purchased had been mounted to the rear brake of an old Schwinn Varsity. I was able to angle the mounting bar to a seat bolt on the Alien-Ray. I then screwed on the head badge and put a Schwinn quality sticker on the seat tube. Finally, I added the lock bracket and the lock. The Alien-Ray was ready for a test ride. Oh, my oh my, is this bike fun to ride. After some adjustment and fine tuning this bike is a blast to ride. People notice it and are quick to point out how cool it is. I may have gotten the gear ratios a little high and the cheap pedals I bought are already squeaking, but otherwise everything seems to be working exactly as planned. I will add an update if I lower the gear rations or change the pedals. The Alien-Ray is very practical too. With the chain guard you do not have to tie down loose pants legs. With its own combination lock, lights, and chain guard the Alien-Ray is good to go at all times. With my other bikes, it seems I am always trying to find some accessory before I ride. For the most part though, the big advantage of the Alien-Ray is that it is fun to ride. As it turns out, the pedals were not squeaking, it was the bottom bracket. I made a homemade press out of a big bolt, nut, and some washers. After I pressed the cups in tight to the bottom bracket, the squeak was gone. I did lower the gear ratios by purchasing a larger sprocket for the three speed hub. I also added some alien head LED blinking lights to the handle bars. With the coaster brake, this bike is a blast for skiding. Unfortunately, my big power skids tend to break spokes. I'm sure I'll be replacing spokes for awhile.